Although most commonly found in offshore waters, some spinner dolphin populations also use nearshore areas. Here they are a great favourite of dolphin watching tours, because of their impressive acrobatics, which include leaps and body slaps, as well as their unique penchant for spinning. They are able to spin on their lateral axis – making up to 7 full rotations in one leap. There are four recognized subspecies of spinner dolphins throughout the species’ tropical range: Gray’s spinner dolphin (Stenella longirostris longirostris) which is the most common form distributed throughout the range; the Eastern spinner dolphin (S.l. orientalis) which occurs in the Eastern Tropical Pacific off the coasts of South and Central America; the central American spinner dolphin (S.l. centroamericana), found only in a narrow strip of habitat along the west coast of central America; and the Dwarf spinner dolphin (S.l. roseiventris) which is found only in southeast Asia and northern Australia1,2. There is also a large population of whitebelly spinner dolphins, which are a hybrid form S. l. longirostris X S. l. orientalis. Spinner dolphins in the Eastern Pacific. Photo courtesy of Robert Pitman. Eastern spinner dolphins (left) are more elongate, are evenly grey all over their bodies, and have a dorsal fin that looks as if it were placed backward, curving forward toward the head rather than back toward the tail. Photo courtesy of Robert Pitman. Dwarf spinner dolphins (centre) reach a maximum length of 1.58m, and have a pinkish belly (the reason for their Latin name – ‘rosiventris’). They are found primarily in Southeast Asia. Photo courtesy of Rubaiyat and Liz Mansur, WCS Bangladesh. Gray's spinner dolphins on the Samadai Reef, Egypt (far right). Photo courtesy of Amina Cesario. Spinner dolphins can easily be confused with other small, long-beaked dolphins that occur in the tropics, including pantropical spotted, striped and common dolphins. However, at close range or from a good photograph, it should be possible to distinguish the unique colour patterns of each of these species. In the Atlantic, the Clymene dolphin is most like the spinner dolphin, but can be distinguished by its shorter beak, slightly more robust body shape, a double ‘dip’ in the dorsal cape, and a pale upper beak rimmed with dark where the spinner dolphin has a more uniformly dark upper beak. Spinner dolphins are found in the Pacific, Atlantic and Indian Oceans, as well as the Persian Gulf and Red Sea. They are generally limited to latitudes between 40°S and 40°N. They are mostly found in deep offshore waters, although they can be observed around oceanic islands or other coastlines where there is deep water near to the coast (such as Central America and Mexico, the Hawaiian Islands, Tawian and the Philippines)3,4. Spinner dolphins are native to the following countries and territories: American Samoa; Anguilla; Argentina; Aruba; Australia; Bahamas; Bahrain; Bangladesh; Belize; Bermuda; Bonaire, Sint Eustatius and Saba (Saba, Sint Eustatius); Brazil; British Indian Ocean Territory; Brunei Darussalam; Cambodia; Cape Verde; Cayman Islands; China; Cocos (Keeling) Islands; Colombia; Comoros; Cook Islands; Costa Rica; Côte d'Ivoire; Cuba; Curaçao; Djibouti; Dominica; Dominican Republic; Ecuador (Galápagos); Egypt; El Salvador; Fiji; French Polynesia; Ghana; Guam; Guatemala; Guinea; Honduras; Hong Kong; India (Andaman Is., Nicobar Is. ); Indonesia; Iran, Islamic Republic of; Jamaica; Japan (Honshu); Kenya; Kiribati; Liberia; Madagascar; Malaysia; Maldives; Marshall Islands; Martinique; Mauritius; Mexico; Micronesia, Federated States of ; Mozambique; Myanmar; New Caledonia; Nicaragua; Niue; Northern Mariana Islands; Oman; Pakistan; Panama; Papua New Guinea; Peru; Philippines; Puerto Rico; Réunion; Saint Helena, Ascension and Tristan da Cunha; Saint Kitts and Nevis; Saint Lucia; Saint Martin; Saint Vincent and the Grenadines; Samoa; Saudi Arabia; Senegal; Seychelles; Singapore; Solomon Islands; Somalia; South Africa (KwaZulu-Natal); Sri Lanka; Suriname; Taiwan, Province of China; Tanzania, United Republic of; Thailand; Tonga; Trinidad and Tobago; Tuvalu; United States (Hawaiian Islands); Uruguay; Vanuatu; Venezuela, Bolivarian Republic of; Viet Nam; Virgin Islands, British; Virgin Islands. Most spinner dolphins feed predominantly at night, preying on small schooling fish, and sometimes squid or crustaceans that live in the deep scattering layer – a dense layer of small marine animals of many different species that descends during the day and rises toward the surface at dusk to feed on plankton5-7. Around oceanic islands, like Hawaii, this leads to a unique and predictable pattern of feeding offshore at night, and resting in protected sandy bays during the day. In open oceans, like the Eastern Tropical Pacific, spinner dolphins’ feeding preferences bring them into frequent association with various species of tuna, as well as spotted dolphins and other oceanic predators that all feed on small shoaling fish. Dwarf spinner dolphins and Central American spinner dolphins that inhabit more coastal areas may feed on a wider variety of bottom-dwelling fish and invertebrates8. Spinner dolphins in the Indian and Pacific oceans often form large mixed species groups with spotted dolphins, common dolphins, bottlenose and striped dolphins, in response to prey availability9. Different poupaltions of spinner dolphins around the world appear to have evolved different social structures and habits. While some nearshore poulations form smaller, more stable groups, some offshore populations live in a ‘fission-fusion’ society, where groups of several thousand or more can congregate to feed and then disperse again8. 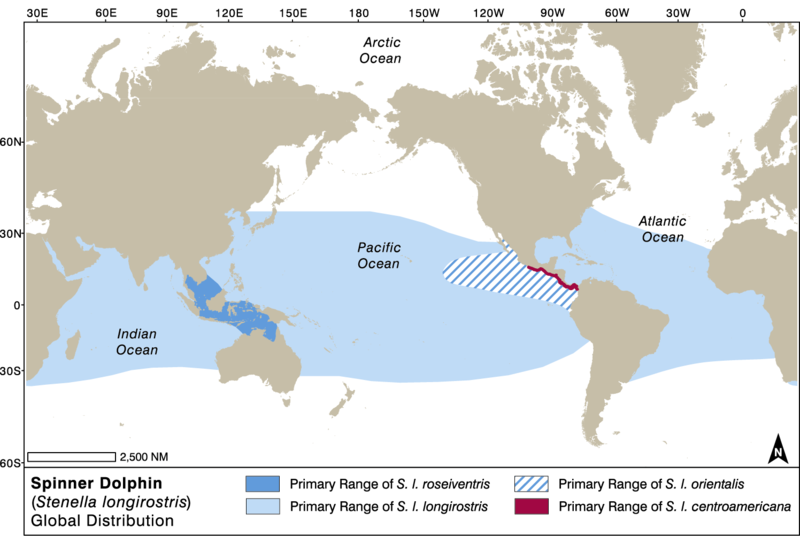 As with pantropical spotted dolphins, the life history characteristics of this species are well known, due to the availability of so many specimens that were bycaught in the Eastern Tropical Pacific tuna fishery. Gestation is 10 months, and mothers nurse their calves for 1-2 years. Females produce one calf approximately every three years. Spinner dolphin mother and calf Samadai Reef, Egypt. Photo courtesy of Maddalena Fumagalli. Spinner dolphins are known to be prey for killer whales and large sharks. Pygmy killer whales, false killer whales, and short-finned pilot whales are also possible predators8. Next to pantropical spotted dolphins, spinner dolphins are the species most severely impacted by bycatch in tuna purse seine fisheries in the Eastern Tropical Pacific (ETP). Because of the species’ frequent association with tuna schools, purse seine fishers look for the dolphins at the surface of the water, and intentionally set their nets around the school of dolphins, encircling them together with the tuna. Between the 1959 and 1972 an estimated 1.3 million spinner dolphins were killed in the tuna fishery in the Eastern Tropical Pacific10. Since then, various measures have been put in place to reduce the levels of mortality, including changes to the fishing gear and procedures that allow dolphins to escape the nets. Reported dolphin deaths in the ETP are now thought to be sustainable, with only a few thousand individuals dying in nets each year, rather than hundreds of thousands. But the ETP spinner dolphin population does not appear to be recovering as well as would be expected11. There is concern that their interactions with tuna fisheries, even if no longer fatal, still cause stress that reduces their fitness and ability to reproduce12. Spinner dolphins also suffer mortality from bycatch in other fisheries throughout their range8 and there is concern that some of this bycatch leads to directed hunting for use as bait in shark fisheries or for human consumption in some of the countries in the species’ range4. 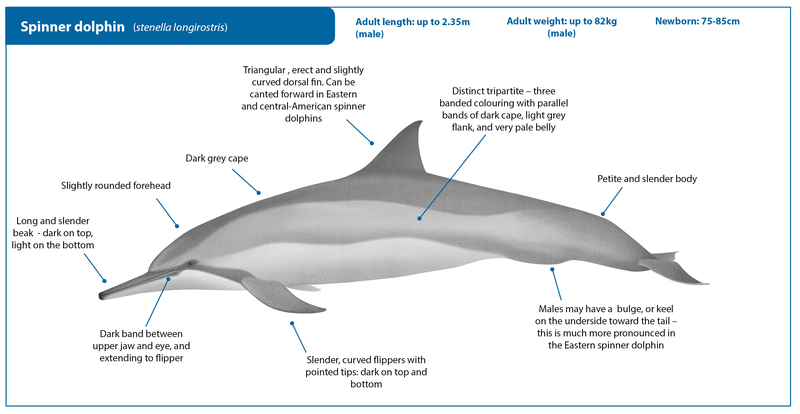 Globally, spinner dolphins are designated as Data Deficient on the IUCN Red List of Threatened species4, and are listed on Appendix II of the Convention on Migratory Species (CMS). Due to the severe depletion of eastern spinner dolphins in the Eastern Tropical Pacific tuna fishery, and the apparent lack of recovery of the population even after by-catch rates have been drastically reduced, the eastern spinner dolphin subspecies (S.l. orientalis) is considered Vulnerable on the IUCN Red List of Threatened Species13. Spinner dolphins' association with tuna, particularly in the Eastern Tropical Pacific, makes them vulnerable to bycatch in fishing gear. Photo courtesy of Robert Pitman. Spinner and common dolphins flanked by a dolphin-watching and an artisanal fishing boat off the coast of Oman. Photo courtesy of Louisa Ponnampalam. Due to their acrobatics and their site fidelity to certain resting bays in some ares, spinner dolphins are popular targets for dolphin watching operations. 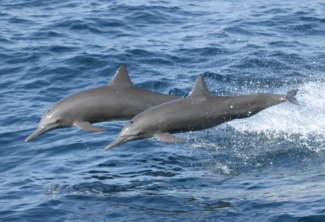 They are the most frequently observed species off of Muscat, Oman, where they have been the focus of dolphin watching since 1996, although a study in 2006 raised concerns about the sustainability of dolphin watching practices there14. They are also the focus of swim with dolphin tourism in Hawaii, where research has shown that tourism has short-term impacts that may compromise the long-term well-being of individual dolphins and the population as a whole15-17. In Egypt, a unique, and so far successful, management programme has been put in place to protect spinner dolphin resting habitat and regulate swimming with dolphins on the Samadai Reef18. 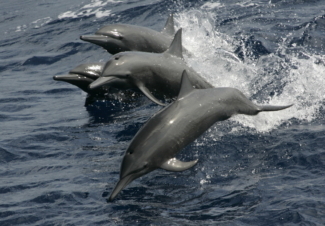 Spinner dolphins also support dolphin watching operations in Bali, Indonesia, and in islands off Brazil. 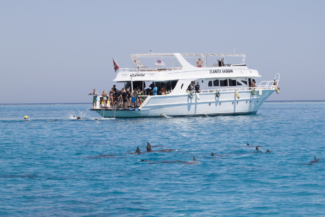 Dolphin watching vessel and swimmers with spinner dolphins on the Sataya Reef, Egypt. Photo courtesy of Photo courtesy of Maddalena Fumagalli. Jefferson, T.A., M.A. Webber, and R.L. Pitman, Marine Mammals of the World: a Comprehensive Guide to their Identification. Second Edition. 2015: San Diego: Academic Press. Committee on Taxonomy, List of marine mammal species and subspecies. Society for Marine Mammalogy, www.marinemammalscience.org, consulted on 11 October 2017. 2017. Perrin, W., F., Stenella longirostris. Mammalian Species, 1998. 599: p. 1-7. Bearzi, G., et al., Stenella longirostris, in The IUCN Red List of Threatened Species. . 2012, http://www.iucnredlist.org/det... Consulted October 2017. Benoit-Bird, K.J. and W.W.L. Au, Prey dynamics affect foraging by a pelagic predator (Stenella longirostris) over a range of spatial and temporal scales. Behavioral Ecology and Sociobiology, 2003. 53: p. 364-373. Ponnampalam, L., et al., Feeding ecology of small cetaceans in the Sultanate of Oman. Poster presented at the 17th meeting of the Society for Marine Mammals in Cape Town, 2007. Ballance, L.T., R.L. Pitman, and P.C. Fiedler, Oceanographic influences on seabirds and cetaceans in the eastern tropical Pacific: A review. Progress in Oceanography, 2006. 69: p. 360-390. Perrin, W.F., Spinner dolphin Stenella longirostris, in Encyclopedia of Marine Mammals. Second Edition, W.F. Perrin, B. Würsig, and J.G.M. Thewissen, Editors. 2009, Academic Press: San Francisco. p. 1100-1103. Querouil, S., et al., Why do dolphins form mixed-species associations in the Azores? Ethology, 2008. 114: p. 1183–1194. Wade, P., Revised estimates of incidental kill of dolphins (Delphinidae) by the purse-seine tuna fishery in the eastern tropical Pacific, 1959-1972. Oceanographic Literature Review, 1996. 1(43): p. 69. Gerrodette, T. and J. Forcada, Non-recovery of two spotted and spinner dolphin populations in the eastern tropical Pacific Ocean. Marine Ecology Progress Series, 2005. 291: p. 1–21. Edwards, E.F., Fishery Effects on Dolphins Targeted by Tuna Purse-seiners in the Eastern Tropical Pacific Ocean. International Journal of Comparative Psychology, 2007. 20: p. 217-227. Hammond, P.S., et al., Stenella longirostris ssp. orientalis, in The IUCN Red List of Threatened Species. Version 2014.3. 2012, http://www.iucnredlist.org/det... Consulted October 2017. Ponnampalam, L.S., Dolphin Watching in Muscat, Sultanate of Oman: Tourist Perceptions and Actual Current Practice. Tourism in Marine Environments, 2011. 7(2): p. 81-93. Courbis, S. and G. Timmel, Effects of vessels and swimmers on behavior of Hawaiian spinner dolphins (Stenella longirostris) in Kealake‘akua, Honaunau, and Kauhako Bays, Hawai‘i. Marine Mamal Science, 2009. 25(2): p. 430-440. Danil, K., D. Maldini, and K. Marten, Patterns of use of Maku'a Beach, O'ahu, Hawai'i, by dolphins (Stenella longirostris) and potential effects of swimmers on their behavior. Aquatic Mammals, 2006. 31(4): p. 403-412. Timmel, G., et al., Effects of human traffic on the movement patterns of Hawaiian spinner dolphins (Stenella longirostris) in Kealakekua Bay, Hawaii. Aquatic Mammals, 2008. 34(4): p. 402. Notarbartolo di Sciara, G., et al., Spinner dolphin (Stenella longirostris) resting habitat in Samadai Reef (Egypt, Red Sea) protected through tourism management. Journal of the Marine Biological Association of the United Kingdom, 2008. 89(1): p. 211-216.